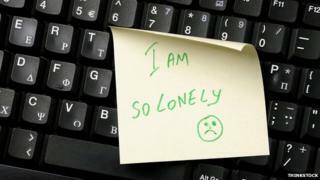 Cyber self-harm: Why do people troll themselves online? Young people are anonymously bullying and trolling themselves online in what some are calling cyber self-harm. Why? Internet trolling is on the increase, according to recent reports. When people are bombarded with abuse and threats on social networking sites the common assumption is that a stranger is doing it, but it's not always the case. Some people do it to themselves. It's known as self-trolling or self-cyberbullying and some charities and social media experts say it is part of another emerging problem, predominantly among young people, they are calling cyber or digital self-harm. Statistics on prevalence are not easy to come by, with just one known study into the practice so far. The Massachusetts Aggression Reduction Centre (MARC) found that of the 617 students it interviewed, 9% had anonymously cyberbullied themselves. "I don't think it dawned on anyone that teens would leverage anonymity in this way, it tends to startle anyone I tell about it," says youth culture and technology expert Dr Danah Boyd, one of the first people to highlight cyber self-harm. "I knew it was me writing that stuff, but on the screen it wasn't me. On the screen it was my mum or my best friend. The posts would say I was ugly, I was useless, I wasn't loved… all the stuff in my head. If I saw it in black and white coming from 'other people' I knew it must be true. But it was exhausting to keep up with. My friends were trying to protect me and stick up for me, so to keep it up I ended up posting nasty messages to them too. It was killing me seeing them get so angry on my behalf and it was then that I knew I had to stop. It wasn't about hurting other people, it was about hurting myself." Ellie, not her real name, was 15 when she started anonymously self-trolling herself. She eventually spoke to the charity www.selfharm.co.uk about her problems and it has given permission for her story to be retold in this article. The teenager set up multiple online profiles and used different names to post abusive messages to herself. "The posts would say I was ugly, I was useless, I wasn't loved… all the stuff in my head," she says. "If I saw it in black and white coming from 'other people' I knew it must be true." Another type of self cyberbullying identified is when people post personal questions online specifically to get negative responses - things like "am I attractive"? The abusive replies reinforce what the person feels about themselves. "It persuaded me I was as bad as I thought, I wasn't imagining it," says 16-year-old Ben, not his real name, who also spoke to www.selfharm.co.uk about the problem. Both are a development in self-harm, says Rachel Welch, director of the charity. "It may not leave a visible injury but it needs to be recognised as a real emotional danger to young people who already have a very damaged sense of self. What's happening is only really starting to emerge now and it's worrying, it can be really dark stuff." In the MARC study people gave different motivations for cyberbullying themselves. They include a "cry for help", to gain attention from adults and peers and to get people to worry about them and "stick up" for them online. While there are similarities with physical-self harm, there are also differences. Behaviour like Ben's is unusual as it involves using a third party, not a common factor in physical self-harm. This form of emotional self harm is psychologically very complex, says Welch. Reasons they gave for cyberbullying themselves included a "cry for help" and "so others would worry about me"
"Self-harm like cutting is a physical response to emotional pain, it distracts the person from that pain. Cyber self harm is replacing emotional pain with another form of emotional pain. This negative emotional reinforcement is extremely worrying. Self-harming behaviours can change rapidly and escalate." Things can escalate in other ways too. To make her cover story believable Ellie started abusing the people coming to her defence. "I was already online and was just feeling really awful. I saw that someone had posted something that I agreed with but lots of people didn't. I commented and people started to be horrible. Everyone was saying things that I felt were true and that's what led me to do it more often. It was a weird feeling, as I believed everything they were saying about me. It was all the feelings I had about myself being confirmed. In a way it felt good, it persuaded me I was as bad as I thought, I wasn't imagining it. I never told anyone, but it was spotted by adults who asked what was going on. I never told them, I just said everything was fine as I wasn't willing to accept I had a problem at the time." "My friends were trying to protect me and stick up for me, so to keep it up I ended up posting nasty messages to them too," she says. Part of the problem for those researching the behaviour is that it's extremely secretive because of the acute sense of shame involved. "Those who do it really fear being found out," says Welch. "The shame and humiliation of being exposed as sending abusive messages to yourself online is huge." A leading adolescent psychologist agrees fear of humiliation is a huge factor for young people. "For adolescents, appearance and relating in groups is all about trying to establish yourself as mature and adult and being exposed as more childlike is a constant fear," says Dr Richard Graham, who works at London's Tavistock and Portman NHS Foundation Trust and specialises in the use of digital and new technology. Graham says he became aware of the behaviour following the death of teenager Hannah Smith. The 14-year-old from Leicestershire took her own life in August after being bullied on social networking site Ask.fm. The site claimed Hannah sent many of the abusive comments to herself anonymously, something her family has asked it to provide evidence of. "The allegations that Hannah had sent some of the messages to herself highlighted the behaviour," he says, "I was utterly surprised by it. I'm not sure how common it is but I suspect it's more common than we know. We need to start unpicking the nature of the phenomenon to try and understand what is happening here." At this stage he is unsure if injury to self is what motivates people and says the term cyber self harm is not always helpful. Both Ellie, now 17, and Ben, received help and have stopped what they were doing. But there are major challenges for those trying to learn more about the practice on a wider scale. "I find that most adults want to blame the problems that they see on technology rather than recognise that youth are simply using technology to enact a whole host of social and emotional issues that they're facing," says Boyd, who is a senior researcher at Microsoft Research, a research assistant professor in media, culture, and communication at New York University and a fellow at Harvard's Berkman Center for Internet and Society. "Technology mirrors and magnifies the good, bad, and ugly about everyday life but it's much easier to blame the technology than to look deeper. Unfortunately, I've found that even experts would prefer to talk about what technology 'does' to youth rather than what it makes visible about youth culture." Parents also have to face up to what is going on and not just blame the internet, says Scott Freeman, founder of cyberbullying charity, the Cybersmile Foundation. He says the charity has not collated official figures but anecdotal evidence shows an increasing number of people getting in contact about self-cyberbullying. "The internet is the new neighbourhood, the new playground," he says. "We equip our kids to play safely in the street, we now have to teach them how to be safe online. Parents can no longer say 'I don't understand the internet' and relinquish responsibility."